I loved books that center around food, as food is such a passion for me, but couple that with an Italian-American twist and I am basically in heaven. I sifted through literally hundred of Italian-American nonfiction, food centered books before settling on The Lost Ravioli Recipes of Hoboken by Laura Schenone. 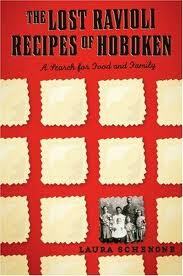 This book is about one woman's journey to revive her Italian family's Genoese recipe for raviolis. Right off the bat, I had the impression that I was in for a treat. Ravioli is not a family specialty of mine... well, we're not Genoese, either, and regions of Italy could not be more different in their cuisine. It's the difference between, say, Hoboken and Alabama. So I thought that it would be a lot of fun to learn about an Italian food that I love--the ravioli. I was in for much more than a recipe in this book, let me tell you that. Besides being about the quest for the author's ravioli origins, this book is also about her family and the complicated relationships therein. As a member of an Italian-American family, I could relate to the gamut of complicated issues from the family feuds to the loss of family through grudge holding. It was nice to be able to relate these items because sometimes culturally, my heritage can be a little isolating. There aren't an abundance of loud, boisterous Italian-Americans bopping around Sussex County, Delaware, if you catch my drift. I enjoyed her insight in this regard and I liked reading about another family who had problems and hang-ups, just like mine and how the author broke through those in her own nuclear family. As for the recipes? Inspiring comes to mind. I especially loved hearing her journey on learning to make pasta as that is one I totally get. I have been making pasta for several years now, and as you do, you just get better and better and it's amazing how much you learn from making the same dish over and over again. This author, though, travels all the way to Italy to learn from "old nonnas" how to make the perfect raviolis... I have to say, that made me just a little jealous. I dream of cooking alongside authentic Italians someday. So how inspired was I? Well, last weekend I awoke and was stricken with the need to make raviolis. No, this was not my first time making raviolis. I had made them just twice before, and the results were.... fair at best, I would say. But this time, armed with the knowledge I had read in this book, I was ready to take on the world of ravioli, one little pillow filled pasta shape at a time. And take it on a did. Remember all that meat I ground in the beginning of the week? Well it went toward these raviolis! The filling is a ground pork simmered in white wine, with carrots, onion and garlic. YUM! It really only takes a little tiny "dot" of filling for the raviolis... and of course, this is only way to make them. You can also spread the filling all over the pasta for a more filled ravioli, especially if you have a press, which I totally intend on buying. After doing a bit of an egg wash, place the one sheet of pasta over the other with the filling. And then you cut it with your ravioli cutter! All in all, this book was really great. It has some great technique tips, and a ton of great recipes in the back, too. It's certainly worth a read if you are into Italian food. A couple of issues with the read was that I felt like the book jumped around a little bit, but that didn't effect my being able to follow the story, so that was okay in the end. Happy ravioli making everyone!